← Red Clover is NOT just for healthy women who want to conceive it is for ALL women who want to conceive. Early peoples generally ground grain and soaked it in water, making a gruel, porridge, or mush which was often then fermented. This fermented porridge was the first widely used edible grain food. Porridge produced from various grains has been a staple in most parts of the world since prehistory. It is highly likely that experimentation with this staple gruel led to the discovery of leavened bread and beer making. Fermented gruel is a traditional food of many cultures. The fermentation process, in addition to adding nutritional value, preservatives and natural alcohol to the food, adds flavor to an otherwise monotonous dish. The lactic acid bacteria produce a souring tang, not unlike yogurt or sourdough bread. Kishk, a fermented wheat porridge made with milk, is a traditional Arab dish that can be stored from winter to summer as a liquid or even longer when dried. Kaffir beer is a widely consumed beverage made of sorghum and wheat. A pink opaque liquid, the drink has a mealy consistency and a fruit-like tang, and bubbles as it is consumed while still actively fermenting. Beer is a thin fermented gruel made of mashed, sprouted grain, or malt. When the grain is allowed to sprout, the growing rootlet produces the enzyme diatase, which acts on the starch and breaks it down to the simple sugar maltose. During fermentation, yeasts produce alcohol. These yeasts greatly enhance the nutritional properties of the fermenting grains. Natural, wild yeasts are excellent sources of lysine, riboflavin, niacin and thiamin, and other amino acids and vitamins. Further, the growing yeasts reduce the phytate concentration in the grain, improving their digestibility. The yeasts will ferment sugars to alcohol in acidic conditions. The acid conditions of the beer are produced by the fermentation action of lactic acid bacteria, primarily Lactobacillus, Leuconstococcus, Streptococcus and Pediococcus. These bacteria add more nutritional value, in the form of protein, amino acids and vitamins, to the food product. Fermented grain foods generally have a protein content 8-20% higher than was originally in the grain. Fermented foods also have enhanced values of thiamine, riboflavin, niacin and amino acids, all vital nutrients for good health. Fermented foods offer several advantages. The acid conditions produced by the lactic acid bacteria, as well as the alcohol produced by the yeasts, inhibit the growth of putrefying bacteria. Thus the fermenting process acts as a means of preserving food, greatly extending its shelf life. When dried, the fermented food will keep for years, as the low water activity and acid conditions prevent the growth of almost all organisms. Fermenting is a simple and easy way to enhance the nutritional benefits of our foods and beverages. In places where there is little or no fuel, fermentation offers an additional benefit, in that it requires no heat source, as in cooking or baking. The earliest direct evidence of beer consumption comes from a stamp seal found at Tepe Gawra, a Mesopotamian city in northern Iraq. Dated at 4,000 B.C., the stamp shows two figures drinking beer using the traditional straws and container. The fermented beverage, about 2% alcohol, was consumed from a clay serving vessel using a large straw made from a reed. Beer was consumed as a food beverage, and a daily ration was approximately 1 liter. Among the Egyptians, beer made from sprouted wheat or barley was an essential ingredient of the daily diet. Ninkasi, having founded your town by the sacred lake. Mixing in a pit, the bappir with sweet aromatics and date honey. the malt in a jar. the cooked mash on large reed mats. You are the filtering vat, which makes a pleasant sound. Aside from homemade fermented beverages such as beer, wine and herbal meads, other important fermented foods include all cheeses produced by lactic acid fermentation, yogurt, sauerkraut, kimchee and other fermented vegetables such as pickles, miso and tempeh (both made from fermented soybeans), naturally fermented meats such as sausage, fermented fish and fish sauces, and leavened breads, especially sourdough. In ancient Rome, sauerkraut was considered delicious and easy to digest and was prized for its medicinal value as well. Large barrels of it were taken on long journeys to the Middle East as the Romans knew it would keep them healthy and protect them from intestinal parasites. When Pliny wrote in 50 B.C. he described two methods the Italians had for lacto-fermenting cabbage. The first consisted of mashing shredded cabbage in a large earthenware urn which was then hermetically sealed. The second method included mixing vegetables and wild herbs with the cabbage, such as cucumbers, turnips and beets, sorrel and grape leaves, and then covering them with a mixture of water and salt. This method was called a composituror mixture. The ancient Greeks also understood that amazing changes took place in the nutritional value of naturally fermented foods and vegetables. Their term for this process was alchemy. Lacto-fermented foods can be eaten as soon as the initial fermentation process is complete. However, these foods improve with age, and experts say it can take up to six months for sauerkraut and other vegetables to fully mature and reach their peak of flavor and nutritional benefits. Lacto fermenting foods is an artisanal craft. It takes a great deal of time, personal attention to each batch and dedication to perfect the process. Because of this, natural lacto-fermentation does not lend itself to industrialization and these wholesome foods are not readily available to consumers in America. In the current regulation-crazed social environment of the United States, small scale food production is severely restricted. In most states, dairy farmers cannot sell milk that is not pasteurized and farmers often may not slaughter and process the meat animals they’ve raised. Homemade breads and fermented food products cannot be sold without a legally certified kitchen. My neighbors in our Southern Italian village, where everything is fresh, natural and organic, and an array of lacto-fermented foods are made at home and are commonly available in the local mercado, would be very amused by these concepts. Italy is the home of the Slow Food movement, after all. The Italian people are absolutely joyous with food. They take their time growing, gathering, preserving, preparing, serving and consuming it. My vacina (neighbor) Rosina is a master of sausage making. 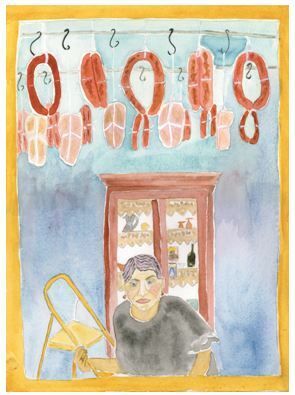 In December, when the people slaughter their pigs, Rosina makes her sausage, like most of the others in the village. She then hangs each one from hooks attached to long poles suspended from her kitchen ceiling. The heat from the fireplace slowly cures the sausage by a natural fermentation process over the following months. I loved the poem about Ninkasi, as a resident of Eugene Oregon I am surrounded by the Ninkasi brewery. I’ve had great luck with lacto-fermentation of cabbage. I figure it’s not rocket science! I’ve also brewed kombucha. I love home fermentation and fully support the slow food movement! Thanks for the article!